Perched on a spartan (but gorgeous) stage with nothing but a guitar, a piano and a few microphones, Adams crooned and caroused his way into the hearts of his assembled fans by simply giving them what they want. Yes, this time out for Adams it was a “greatest hits” tour to be sure, a concept that may tend to leave some concertgoers (read: me) with the unpleasant taste of “cashing-in” in their mouths. Luckily though, Adams has proven to be a savvy (and fussy) enough performer to never simply stick to the plan. In fact on this night he even wrote a song about his plan (you can listen to it here), and for the most part it was moments like these that made the evening what it was. They both have a plan. Ryan Adams plan is different. Maybe.Opening with “Oh My Sweet Carolina” and then proceeding to touch on the best material from nearly every period of his career (“My Winding Wheel”; “If I Am Stranger”; “Firecracker”; “Rescue Blues”; “Please Do Not Let Me Go”; a stellar rendition of Whiskeytown’s “Houses On The Hill”), Adams took full advantage of the Strathmore’s elegance and practically perfect acoustics. Stripping everything down to it's barest of bones, he wisely chose to simply let the songs speak for themselves to the so-quiet-you-could-hear-a-pin-drop room, leaving the audience, at least at first, relatively speechless. Now, we’ve previously discussed the strength, or lack thereof, of Adams' catalog when taken as a whole, so it come as no surprise that some of the material simply didn’t work as well as others. For the most part the songs pulled from 2011’s Ashes and Fire were serviceable, but glaringly anemic when held up next to some of the older material. To a slightly lesser degree the same was true for the songs played off of Easy Tiger. And while those songs are starting to age well (time heals all wounds) they still sometimes feel like castoffs from a better, more focused record, that Adams was working on but will never see the light of day. And speaking of seeing the light of day (since we're all here hanging out in the beat-em-up part of the review), I guess I should just throw this out there: The world probably never needs to hear his cover of Oasis’s “Wonderwall” ever again. It may have served a purpose in someone’s (or a lot of someone’s) adolescence, but they likely aren’t those people anymore, and more importantly, Ryan Adams isn’t that person anymore, which is probably the biggest takeaway from seeing him on this tour. Adams has that reputation of being the fussy, rock-and-roll bad boy with ALL of the feelings (There’s none left for you! ), and for a while there it seemed that he would conceivably be stuck with that concept of him as an artist for the duration of his career. These days though, it seems that Adams is comfortable with his place in music establishment. While there is still some of the nervous energy there (I cringed when someone took a picture with their flash, thinking “This is it. END OF SHOW.”), and he openly acknowledges that he doesn’t know how “he ever ended up writing this f@#$ing music” (the sadder the better!) and that in his heart he feels that we should all be getting hammered at a White Lion concert wearing jeans so acid-washed that they are about to explode. It’s wistful thinking, but not totally off the mark for what COULD happen at Ryan Adams show. After all this is the man that brought the world the space metal masterpiece that is Orion. In the end, seeing the hits was great, and, let me be clear here, as a musician/singer Adams is practically peerless, but it he’s never been one to rest on his laurels and now may be the time for him to step up, fully banish the ghosts of his past and become the truly legendary artist that everyone knows is in him somewhere. As if to drive that point home, Jason Isbell performed a three song encore with Adams, which proved to be the most engaging part of the evening. Beginning with Isbell’s own “Danko and Manuel” (from his days with The Drive-By Truckers), then moving on to Whiskeytown’s “Jacksonville Skyline”, finally sticking the landing with a “serious” cover of Alabama’s “Love In The First Degree”. The duo not only sounded fantastic, they seemed to be honestly enjoying just playing together and had they proceeded to cover Iron Maiden’s The Number Of The Beast in it’s entirety, I don’t suppose that anyone would have been surprised, and it would have most likely been welcomed. The point I’m trying to make here is that Adams can do what he wants at this point. It’s a fact that people paid upwards of $100 a ticket to see “Ryan Adams: HIT MAKER! ", but it’s also a fact that they would just as easily sit through a show of Adams, the musician, asking them to follow along wherever his muse takes him. 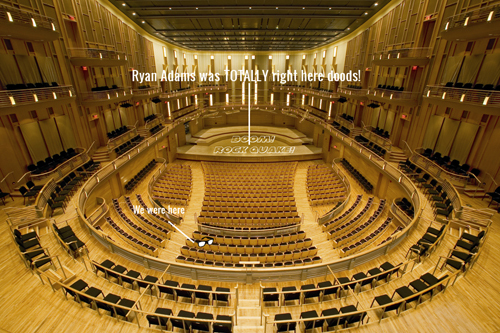 That’s the Adams that I want to see in the future, and walking out of the Strathmore as Kiss’s “Lick It Up” played over the loudspeaker (a first? ), I have to think that despite his past, he may yet reach those Olympian heights that his talent would suggest.